Add thing to observations light unsteady on feet. Add speeding and cover up odors, smoking or chewing gum to mask the odor. I’m pleased over all with the app. It is a little pricey for a month to month subscribers. This app saves me at least 45 mins per incident and the report is much more detailed. Highly recommended! DUI checkpoints, bending the Constitution and generating revenue one stop at a time. I have been using this app since me and my partner found it about a year ago. 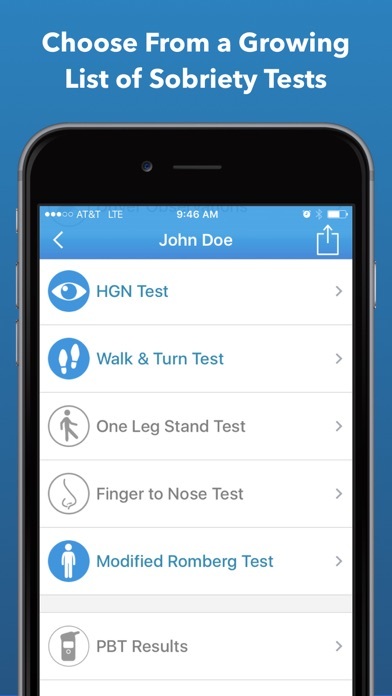 We have noticed how easy it is to use and recommend it to anyone who asks about improving efficiency in field sobriety testing. It is really easy to use and it keeps improving. It would be great to have this app in the I Pad as well. Great app I’ve used a lot! Paying for a subscription for this App just to do a DUI every now and again is not worth it. I would rather see a one time fee rather the. Get stuck into another subscription. Looks to be a great app as I have used another app just like it. I could only imagine the reports would be as detailed. get rid of subscription and charge a one time fee. Would love to see sections added for “vehicle in motion” phase and “reason for stop”... other than that, it’s very close to perfect !! An excellent app HOWEVER, no app is worth this on-going costs. The app should be a one time fee. If nothing else there should be an option for departments to pay one fee for all their officers yearly. I will not pay that much per month. I agree with others. Make it a one time purchase. I would pay $20-$25 for this app. Great app...but why the membership? I have used this app a couple of times since I’ve gotten it, and even played around with it some with my fellow officers. However, I do not see the need for the membership, let alone $5/mo or $45/yr for a membership. I’d be better with a “one-and-done” payment, and LEO only verification. Again, great app, but my only issue is the monthly or annual membership costs. I have been using this app for almost a year and the improvements have made it hands down the best app I have found for the iOS platform. I agree that adding a few things such as a section for Chemical Analyst and Intox testing would make it that much better and a complete DWI app vs. just the SFST. 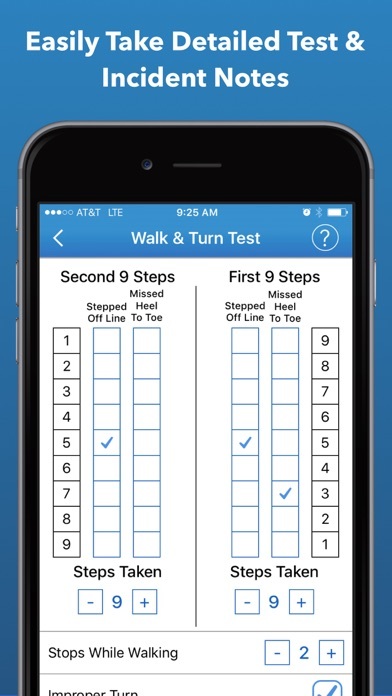 Also, for walk and turn, re-arranging the check boxes to run left to right instead of top to bottom would be much easier to input, along with a description narrative on how the turn was wrong. The last thing I would like to see would be a voice record box so that the officer could speak the steps missed and then go back and mark them off bc it does happen quickly. I recently noticed that the pricing structure has changed and it has become a monthly service instead of a one time purchase. While I do love this app, I would not have originally purchased the pro upgrade as a monthly subscription. I’m an officer with nearly 1K DUI evaluations under my belt. I was pretty excited to discover this app. It works very well for the roadside bit. I have a couple of recommendations for how to really send this app over the top: 1) Add a Vehicle in Motion section where we can either select violations or type a narrative right there. 2) Add “additional observations” sections in each of the tests so we can make comments on elements of the tests that were noteworthy but not official clues (ie, counting weirdly during the one leg stand). 3) Add a chemical test section, ideally one in which we can upload our own preloaded templates. For example, have a screen where the options are blood or breath, time of test, results if known. These improvements would vastly assist with the time I’ve spent adding all these things to the narrative after the fact. Additionally, there are a couple of small grammatical errors that I have to correct in the template prior to submitting my reports. Thanks for a useful app! This app starts out saying it’s free but ends up costing money! Would be great if it had a couple free trials to see if it’s worthwhile! Long time user, now app is useless. Had this app for what feels Iike forever and now have gone to use it again and it’s rendered useless unless I pay $5.00 a month? Ridiculous. App looks good. I would have done a one time fee, but no way am I paying a monthly feel for a app that might get us d 2-3 times a month. Please consider changing your prices. Very deceiving that you don’t tell the monthly fee before downloading! It’s quick and easy. Great too to speed up the process. Especially for a new officer. Would like to see an option to read the instructions for the exercises. Ridiculous monthly price, would’ve considered a one time purchase. Love this app and the features it has. Cuts down my report writing time. You’ll still have to add a few things to your narrative, which is expected to make it sound more “personal” if that makes sense. All in all I give it 4.9 out of 5. 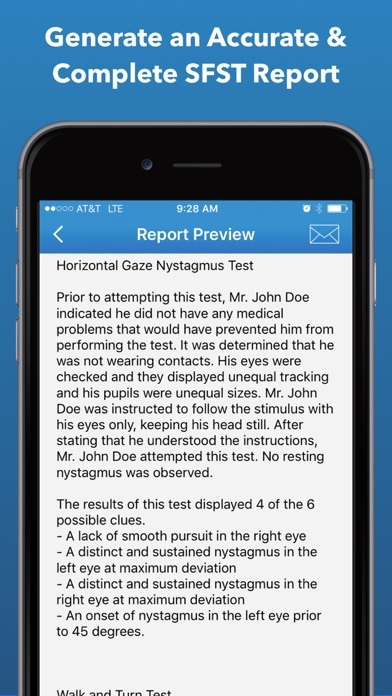 It would be nice if it also had a feature that allowed me to read Indiana’s Complied Consent! Allows the officer to work faster and more effective. Not as time consuming and develops well written reports. Helps the officer whom is not well versed in SFST and DUI/DWI. Amazing app! Keep up the great work! Great app! Two additions would make it even better. The app works great. The app assists officers in maintaining organization throughout the DUI investigation while making the process much quicker and easier. Two additions id like to see in the future is a section for vehicle in motion with selectable most common DUI driving indicators as well as your reason for stop. I'd also like to see the ability to edit the narrative template used within the app, so officers could add their style or incorporate their department policies into the preprogrammed narrative template. Thought the app would be great for work, but I can't justify $4.99 per month. Are you kidding. Would have been nice to know the price before I wasted my time downloading it. Great asset for Police Officers! I love this app! It is a great asset in the field when conducting field sobriety tests! The report feature is very nice and helps cut down on paperwork time a bit, though I have to modify the report to our department standards. Buy the full app, you won’t regret it! I think the app is awesome. 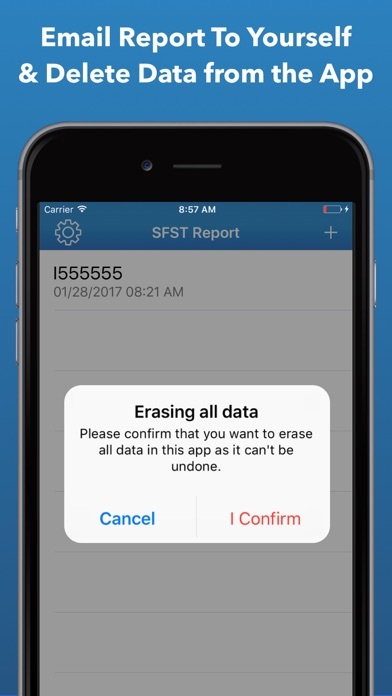 The app helps a lot with the SFST process. Please keep updating the app and keeping it well suited for use. Great! Love it with the additional tests. Keep improving the app! I've used it several times so far! I downloaded the app to help me keep track of all of my DWI notes. It's missing two article and that is "was the vehicle in motion? ", "Did the vehicle cross the centerline/fog line?" That will help strengthen your probable cause. The app does freeze at some parts but once you close it re open it, issues are solved. Not bad for the report either!! Get the app! A few of these updates were added!! Simple and stunning! Just charge $2.99 from the beginning instead of waiting until I download to find out that I cannot use all features without paying. 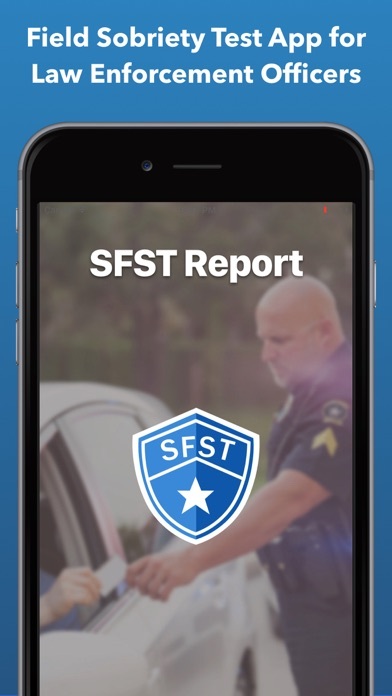 Working with the developer over the past few months to make this app more useful and an asset out in the field as a law enforcement officer has been very positive. The response time is reasonable and communicates with you on the process. The latest update has caused a problem. The app won't open. The latest update has created issues: Does not open (iPhone). I have used the app several times and it is very useful and user friendly. I like the report/email feature as well. Just please fix the last update!! Just downloaded and playing with it. WARNING: it's a purchase for all 3 SFST tests to be used. Generated a report and am pretty impressed. Have. It used in field yet, but will purchase the others and test this weekend. Not a bad app, needs indiana state plate option added, also would be nice to have instructions to each test so you have them word for word.